With the banking side of Rakuten’s platform growing, it makes sense for Rakuten Ventures to invest in financial technology (fintech) startups. 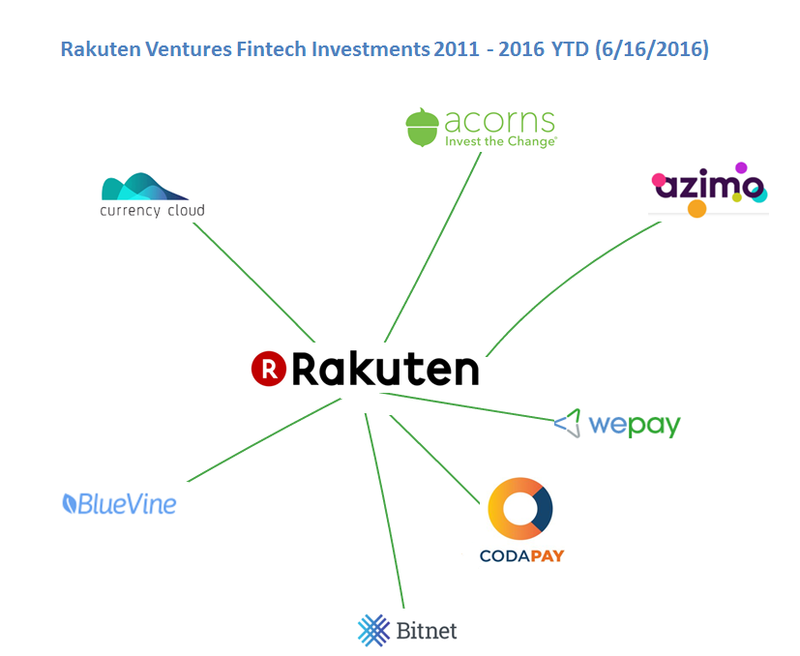 For that, Rakuten Ventures launched a $100 million global fund for fintech startups in Q4 of last year. Rakuten is a strong platform in Japan, but not so internationally. Maybe a breakout hit or two in fintech under Rakuten’s belt could help with that. Rakuten is also among the most active Asian tech corporates and are likely to become even more active with the announcement of their new fintech-focused fund. Their investments span bitcoin companies like Bitnet, payments startups likeCurrency Cloud, and remittance technology services like Azimo, among others. The graphic below includes both Rakuten and Rakuten Ventures investments, and excludes Rakuten acquisitions.